A business class circuit was paramount to reliability and uptime required for crucial services like voice or video. This type of network access has low latency characteristics which keeps the amount of time it takes to forward the voice traffic low so that conversations are not made off kilter by long delays. Also absolutely critical to voice or video over network pipes is an additional layer over these high quality dedicated connections, something called quality of service or QoS. 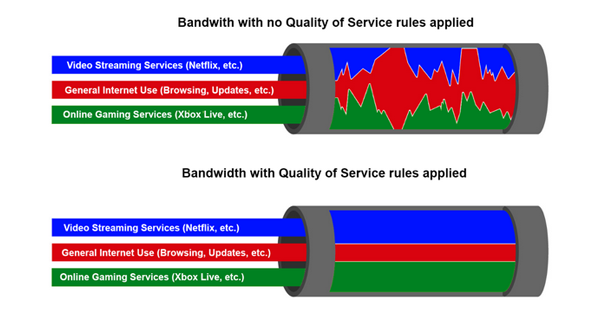 QoS is a suite of bandwidth prioritization and reservation techniques that give select services fast lane access to bypass lesser classifications of traffic and also reserves bandwidth preventing exhaustion of available throughput. Most commonly, QoS is used in tandem with carrier services like an IP VPN or Multi-Protocol Label Switching (MPLS) and have been assumed by many to be the only way to reliably deliver voice services for an organization. I can affirm as a network engineer for the past few decades, this has been the case for most of my career. In order for voice to perform adequately, specific care was required to specify dedicated pipes with prioritization and if you did not perform technical due diligence, you were asking for trouble in the way of poor quality, session disconnections and general voice issues. Then something called Software Defined Wide Area Networks or SD-WAN came along. This nascent technology space is drastically changing the way we do a lot of things on the wide area network, including managing sensitive real-time protocols that typically require QoS. Read more on what SD-WAN is here. Let's take a look at some of the mechanisms that make SD-WAN different versus how we've implemented voice over traditional networks up until now. Though many of these techniques may not qualify specifically as QoS, they mimic the capabilities and allow for more reliable Internet based infrastructure to support real-time protocols. The combination of these techniques that have been used individually for decades, create a service greater than the sum of its parts. Features now considered fundamental aspects of most SD-WAN platforms are differentiators from the means we have used in the past to run network traffic over networks. 1. Multi-Path Steering - SD-WAN can actively forward over multiple paths and is constantly measuring the performance characteristics and properties of each path available. Because it can very rapidly identify issues like high latency, packet loss and jitter, there are software mechanisms to quickly bypass these issues by utilizing an alternate, better performing path on the fly. 2. Forward Error Correction/Packet Duplication - When issues like data loss from dropped packets arise, if there is only one path available or all paths are experiencing loss, that can be a serious issue with traditional networks with little means to remediate. SD-WAN employs features such as Forward Error Correction (FEC) or packet duplication, which becomes enabled once packet loss is identified on a path. This technique will send duplicates of each packet in the flow over a single path or over multiple paths to have greater assurance that critical data like voice or video will make it to the destination. At the other side of the session for that voice or video stream, the first packet received will be forwarded to the destination and the duplicates packets will be dropped but if packets are dropped, the duplicated packet will be used in its place. 3. Jitter Buffering - Voice and video quality can suffer from a network condition called "jitter" which is when the information sent over the network is spaced inconsistently leading to a variable tempo for the stream. The result is audio or video that can have gaps in timing and become impaired. SD-WAN measures the gaps between the packets and can evenly space these packets on the other side providing what is called a "jitter buffer" to realign the timing of these packets to keep the video or audio stream cadence intact. Jitter buffering has been performed before but traditionally at the application servers and endpoints (i.e. IP phones or IP video appliances). The unique differentiator for SD-WAN is performing this inline on the network versus relying on the end points and application servers to supply the jitter buffering. 4. Prioritization and Queuing over Multiple Tunneled Paths - Because SD-WAN performs it's queuing and packet forwarding over something called an "overlay", the forwarding decisions for information that has the highest priority and reservation of bandwidth for applications is performed at a layer above the traditional IP interface. With this, a priority "fast pass" can be given to crucial data like voice, video or other business essential apps bi-directionally and this can be done over all paths available. These overlays are typically facilitated with tunnels over top of existing infrastructure versus on the actual underlay interfaces. This allows user defined packet queuing and service prioritization configuration overtop of service provider links. So as you can see, there are many pieces that come together to make IP based voice over broadband and Dedicated Internet Access (DIA) now possible. Our organization has played a part in designing many SD-WAN based solutions for customers and have seen it perform in the "real world" so can attest first hand, it works. We are beginning a new era of intelligent, self-healing networks which Software Defined Networking (SDN) applications like SD-WAN will be leveraged to usher in. Though many of the technologies leveraged by SD-WAN are not new, the way they are put together and managed by an SDN controller is and it is this combination that makes it truly powerful. It is with great confidence that I can state, SD-WAN is not a fad and it will be a fundamental piece of how organizations will build out their connectivity moving forward.